Cotton Candy Machines for Home and Business Use. From Benchmark USA..The Zephyr is great new starter Cotton Candy Machine. Economical way to start generating some profits and fun for 2018 at a low enough price that almost anyone can afford! This Table-Top Cotton Candy Machine will produce up to 60 cones per hour. The unique heating element gets to flossing temperature in just seconds allowing for “on demand” operation making it ideal for environments that make only one cone at a time. The simple two-switch system allows for easy operation. 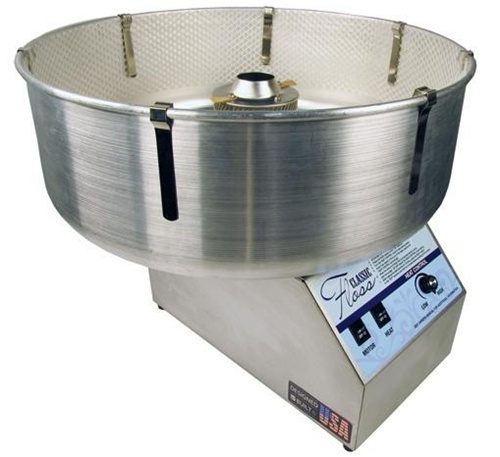 The Zephyr Cotton Candy Machines comes complete with the aluminum bowl and acrylic dome and is covered by Benchmark USA’s exclusive three-year warranty. Weighing just 21 pounds, it is easily transported with the two convenient handles. Great cotton candy machine for rental stores. The spinning head is removable for easy cleaning. Attractive and Stylish Benchmark USA Trolley/Cart for Cotton Candy Machines. This Cotton Candy Cart will fit the Zephyr Cotton Candy Machine Listed Above while allowing for ample work space and storage, as well as greater mobility. It features a storage shelf in back to hold all necessary supplies, 3 handy cotton candy cone holders, and eye-catching graphics. The Benchmark trolley will fit most other popular cotton candy machines. Makes a great visual set up for theme parks, festivals, kids parks, and more! This Paragon Cotton Machine not only has a new design, but a new colorful attractive look as well! Spin delicious Cotton Candy - and Profits with this easy to use Paragon Cotton Candy Machine with a plastic bowl. This is the most efficient and well made Cotton Candy Machine that Paragon has ever built. The Spin Magic 5 Cotton Candy Machine is a durable, economical model with a 5” spinning head that can produce about 200 servings per hour. * It comes with a light weight, but tough, plastic bowl. An aluminum replacement bowl is also available. The Spin Magic Cotton Candy Machine features an extremely durable tubular heating element and spinning heads that can be disassembled without tools for easy cleaning! No ribbons required for this machine that tend to clog up and cost you a lot of money by having to replace them regularly! The cost of this commercial cotton candy maker is less than any comparable model on the market. Grab one today to get in on the busy Spring 2019 Cotton Candy Season! Another avenue where fun and profit meet at Standard Concession Supply! The Paragon Cotton Machine not only has a new design, but a new colorful attractive look as well! Spin delicious Cotton Candy - and Profits with this easy to use Paragon Cotton Candy Machine. This is the most efficient and well made Cotton Candy Machine that Paragon has ever built. The Spin Magic 5 Cotton Candy Machine is a durable, economical model with a 5” spinning head that can produce about 200 servings per hour. * It comes with a light weight, but tough, metal bowl. An plastic replacement bowl is also available. The Spin Magic Cotton Candy Machine features an extremely durable tubular heating element and spinning heads that can be disassembled without tools for easy cleaning! No ribbons required for this machine that tend to clog up and cost you alot of money by having to replace them regularly! This cotton candy machine will produce 200 servings per hour! And the cost of this commercial cotton candy machine is less than any comparable model on the market. Grab one today to get in on the busy Spring Festival Cotton Candy Season! Click on the link above to see operating video. Paragon's Classic Floss 5 Cotton Candy Machine with Metal Bowl. Our easy-to-use Classic Floss 5 machine has a complete new head design that produces cotton candy continuously and smoothly. The Classic Floss cotton candy machine with metal floss bowl uses a durable tubular heating element with an easy to clean high performance all metal construction 5" spinner head. The all metal design gives your superior durability over other brands that uses plastic parts. Produces 3 servings per minute or up to 200 cones per hour. Blue Deep Well Cotton Candy Cart to compliment your Spin Magic or Classic 5 Cotton Candy Machines. The New Deep Well Cotton Candy Cart provides ideal machine positioning for serving fresh cotton candy. This Cotton Candy Cart features a superior design in that the Deep Well cart is designed so that the cotton candy machine will sit down inside the cart allowing easier and more efficient access to collect the newly made fluffy cotton candy. Floating shelf with pre-drilled holes to display ready made cones. Constructed of 18-gauge steel: this cart is designed to uphold operation of any cotton candy machine's performance and powder coated paint for durability. The cotton candy machine pictured is sold separately and does not come with the purchase price of this cart. 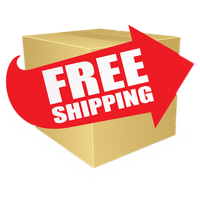 Lead time for Shipment of the cart is 1 to 2 weeks. Nostalgia Commercial Cotton Candy Machine-CCM-600. Now the EMG offers a commercial size cotton candy maker. It's a large upgrade from their home only mini cotton candy maker. Cotton Candy Cart is included with this commercial size cotton candy maker. The design and style is nostalgic and resembles the old fashioned cotton candy makers of the early 1900's. Full size cotton candy maker that stands over 4 feet tall. 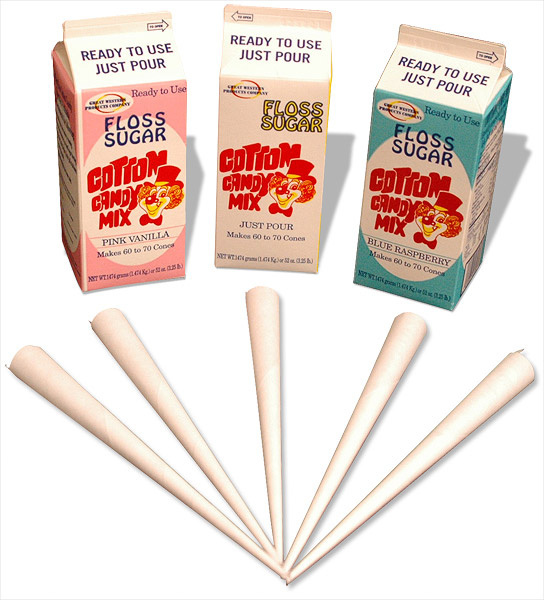 You can use a variety of cotton candy sugar flavors that can be found in our cotton candy products store. Makes 3 cotton candy cones per minute. Ideal for birthday parties, family gatherings, the fall festival season activities, and more. For home or commercial use. Handy side rack holds six cones. Click on link above to see video on how this machine operates. Cotton Candy Floss Bubble. Protect your cotton candy from the wind, debris, and other elements with this sturdy cotton candy bubble. Also offers protection to your customers from flying sugar debris that may be directed toward their eyes. Clips to any 25" to 26" diameter floss bowl. Stainless steel clips furnished, but not installed. Virtually unbreakable bubble under normal use. Paragon Floss Roll Bubble. Protect your cotton candy machine when it's not in use with our roll-top bubble that provides one-hand access to the production compartment. The top shields customers from floss sugar and the cooking chamber from dust, insects and airborne particles. The optional antique cart is custom-designed specifically to accommodate your Paragon Cotton Candy machine. It creates mobility while providing storage for all of your supplies in the ample storage body. This cotton candy cart is constructed of stainless steel and has a chip-resisted coating. And the attractive antique styling will help draw customers for impulse sales. Gold Medal's Stainless Steel Econo Floss Cotton Candy Machine - Model # 3017SS. Many features of the Midway Models. Includes a spun aluminum bowl and a whirlgrip stabilizer. Features a stainless steel cabinent that is easy to keep looking new for years to come. Now has a solid state heat control. This durable cotton candy maker has an extra-duty motor plus solid state. Four carbon brushes help reduce wear and tear on the brass slip rings. This profit maker plugs into any wall outlet, and makes 2 to 3 servings per minute. Plexi Glass Bubble is not included, but may be purchased as an optional item.